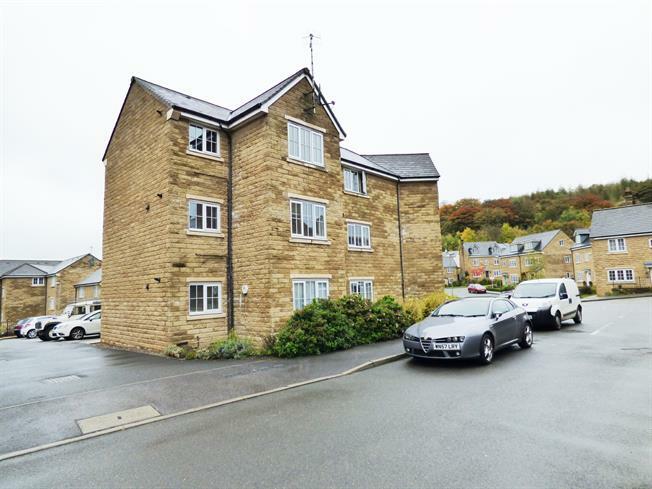 2 Bedroom Flat For Sale in Buxton for Offers Over £90,000. Offered for sale with no chain this immaculate upper floor apartment offers accommodation including an entrance hall with cloaks cupboard, a spacious living/dining room with an open plan aspect to the kitchen area, a master bedroom with fitted wardrobes, a good sized second bedroom and a bathroom. Other features include central heating and double glazing throughout, allocated and visitor parking. The tenure is leasehold with 113 years remaining and annual ground rent and service charges of 175 and 909.72 respectively. Entrance door and intercom and a built-in storage cupboard. Fitted with wall and base units, roll top work surfaces including an inset stainless steel one and a half bowl sink with mixer tap and drainer, an integrated electric oven, an integrated gas hob with over hob extractor, plus space for a washing machine and a fridge/freezer. Double glazed uPVC window facing the side, tiled flooring, tiled splashbacks and downlights. Double glazed uPVC window facing the side, radiator and fitted wardrobes. Comprising a panelled bath with mixer tap and shower over bath, a pedestal wash hand basin and a close coupled WC. Heated towel rail, tiled flooring, part tiled walls and an extractor fan. .